Is this the most detailed Full HD image from a budget projector? Absolutely. And that's all down to Darbee Visual Presence video processing tech, though this single-chip DLP beamer lacks the tools for an easy set-up. An entry-level, occasional entertainment projector like the Optoma HD28DSE needs three things; a low price, a really simple set-up, and picture quality eons better than that old data projector from work you used to use. The HD28DSE has two of those things. Its chief feature is undoubtedly the Darbee Visual Presence technology that's designed to extract extraordinary levels of detail, depth, lighting and object separation. Also including BrilliantColour image presets, the HD28DSE's 3,000 ANSI Lumens lamp means it can be used in anything but the brightest of daylight. 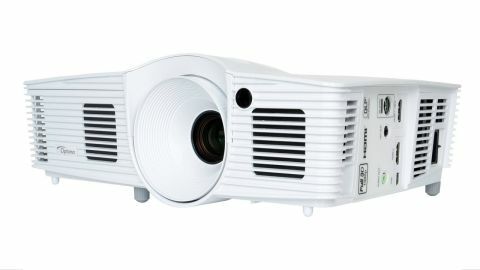 A single-chip DLP projector with a Full HD resolution, the HD28DSE comes in a bright white chassis with a bulge over the lamp that serves to accentuate it. It's nothing special to look at, but at 315x114x223mm and 2.5kg in weight it's easy to pick-up and put away one-handed. That's important on an occasional-use projector like the HD28DSE, and so are plenty of ins and outs. Instead of the the suspiciously data connections that some 'entertainment' projectors offer, the HD28DSE's ins and outs are firmly home cinema. A couple of HDMI slots (one of which can take an Amazon Fire TV Stick, Roku Streaming Stick, Google Chromecast or a direct hook-up to a phone or tablet), a 3.5mm audio output, a 3D sync slot, 12V trigger and a mini-USB is all there is. All are accessed via a side-panel, which is unusual on any projector, but nonetheless welcome. Also available as add-ons are Optoma's WHD200 Wireless HDMI System and the Optoma HDCast Pro streaming dongle. As that audio output might suggest, the HD28DSE boasts a built-in speaker, though at 10W don't expect to pack away the 5.1 sound system just yet. Perhaps most impressively, the HD28DSE's lamp is rated to last for a stunning 8,000 hours. Wow. Less wow is that while the HD28DSE can technically handle 3D, though there are no 3D specs included. Is that a crying shame or an easy way to save £100 or so? That will depend on your feelings towards the third dimension in film. Although initial set-up isn't the easiest – with 1.1 optical zoom and no lens shift levers included – almost everyone will need to resort to digital keystone correction to get a straight image. To get an 80-inch image in my test room, the HD28DSE had to be placed between 2.4-2.8m – hardly any wriggle-room. If that's a shame, so is the out-of-the-box picture quality. The Darbee Visual Presence video processing onboard is working hard on The Hobbit Blu-ray test disc, though its most powerful picture preset overcooks the image. With the amusingly named Full Pop (strongest) mode engaged, colours are too aggressive with dark areas of the image suffering from 'black hole' syndrome where nothing is visible within. Graphics also suffer from echoes on this mode. However, the level of Full HD detail is stunning. I mean, truly awesome – this is the most detailed budget projector I've ever seen. Switch to the less in-yer-face Hi-Def mode and balance is restored, with excellent skin tones and colour gradations. That detail remains, and without a whiff of motion blur either. The third mode is Game, and the exact intensity of all three modes can be set up to 100. As well as the HD28DSE throwing a hissy-fit for a few seconds too long after changing the video source (the colours go mental! ), I did notice some rainbow effects while watching the HD28DSE. This is when some people – like me, but not necessarily you – see flashes of red, green and blue in the picture as they're projected sequentially onto the screen. It is a single-chip DLP, after all. Although the cost is average contrast, it's also worth deactivating the Dynamic Black feature if, like me, you don't want to see the image visibly change in brightness. The projector otherwise permanently monitors, and reacts to, the ever-changing video content. Aside from those two issues, the HD28DSE is an accomplished movie-machine – and that's surely largely down to Darbee Visual Presence.